In November 1914, the nation mourned a collective loss. One of the nation’s most famous soldiers had died and was buried in St Paul’s Cathedral: Field Marshal Lord Roberts VC, known to many simply “Bobs”. Such was the appeal of Lord Roberts, his image was used on a recruiting poster. Roberts was born in India in 1832 and, after growing up in the UK, he first made his name there in 1858 when he was awarded the Victoria Cross for gallantry during the Indian Mutiny (as it was known by the British) when he saved the life of a sepoy (Indian private soldier) loyal to the British, and captured the flag of a rebelling unit. He was also present at the arrival of British troops at Lucknow in March that year. His lasting fame came after his actions in Afghanistan in 1880 in the UK’s second war in that country, when he launched a 300-mile march from Kabul to Kandahar to relieve a British garrison there. The march made him a household name. In 1885 he became the commander-in-chief of army in India. He was appointed as commander in South Africa during the Second Anglo-Boer War in 1899 and further advanced his national reputation when the British eventually won that war. After three years as Commander-in-Chief of the Forces (i.e. head of the Army) he retired in 1904. The next decade saw him campaigning for national service – conscription – and preparation for war against Germany. In 1906, he helped William Le Queux to prepare his book The Invasion of 1910, a bestseller that was serialized in the Daily Mail. He was president of the National Service League from 1905. When war was declared in 1914, he was made colonel-in-chief of the empire forces (i.e. the non-British part of the Empire’s forces). While visiting Indian troops at St Omer, he died of pneumonia on 14 November 1914. The Oxford Dictionary of National Biography describes him as “Roberts was perhaps the ablest field commander since Wellington”. Gaumont’s contemporary compilation film about Roberts can be viewed on the IWM website. On 19 November, he was laid to rest in St Paul’s Cathedral after his body had travelled in a flag-draped coffin on a gun limber through Ascot (where his estate was), on a flag-draped train to London, and through the hushed streets of the capital. The music began. It was the Dead March in Saul. The long-rolling drums suddenly rent the soul, and destroyed every base and petty thought that was there. Clergy, headed by a bishop, were walking down the cathedral. At the huge doors, nearly lost in the heavy twilight of November noon, they stopped, turned and came back. The coffin swayed into view, covered with the sacred symbolic bunting, and borne on the shoulders of eight sergeants of the old regiments of the dead man. Then followed the pall-bearers—five field-marshals, five full generals, and two admirals; aged men, and some of them had reached the highest dignity without giving a single gesture that had impressed itself on the national mind; nonentities, apotheosised by seniority; and some showed traces of the bitter rain that was falling in the fog outside. Then the Primate. Then the King, who had supervened from nowhere, the magic production of chamberlains and comptrollers. The procession, headed by the clergy, moved slowly, amid the vistas ending in the dull burning of stained glass, through the congregation in mourning and in khaki, through the lines of yellow-glowing candelabra, towards the crowd of scarlet under the dome; the summit of the dome was hidden in soft mist. The music became insupportable in its sublimity. G.J. was afraid, and he did not immediately know why he was afraid. The procession came nearer. It was upon him…. He knew why he was afraid, and he averted sharply his gaze from the coffin. He was afraid for his composure. If he had continued to watch the coffin he would have burst into loud sobs. Only by an extraordinary effort did he master himself. Many other people lowered their faces in self-defence. The searchers after new and violent sensations were having the time of their lives. The Dead March with its intolerable genius had ceased. The coffin, guarded by flickering candles, lay on the lofty catafalque; the eight sergeants were pretending that their strength had not been in the least degree taxed. Princes, the illustrious, the champions of Allied might, dark Indians, adventurers, even Germans, surrounded the catafalque in the gloom. G.J. sympathised with the man in the coffin, the simple little man whose non-political mission had in spite of him grown political. He regretted horribly that once he, G.J., who protested that he belonged to no party, had said of the dead man: “Roberts! Well-meaning of course, but senile!” … Yet a trifle! What did it matter? And how he loathed to think that the name of the dead man was now befouled by the calculating and impure praise of schemers. Another trifle! As the service proceeded G.J. was overwhelmed and lost in the grandeur and terror of existence. There he sat, grizzled, dignified, with the great world, looking as though he belonged to the great world; and he felt like a boy, like a child, like a helpless infant before the enormities of destiny. He wanted help, because of his futility. He could do nothing, or so little. It was as if he had been training himself for twenty years in order to be futile at a crisis requiring crude action. And he could not undo twenty years. The war loomed about him, co-extensive with existence itself. He thought of the sergeant who, as recounted that morning in the papers, had led a victorious storming party, been decorated—and died of wounds. And similar deeds were being done at that moment. And the simple little man in the coffin was being tilted downwards from the catafalque into the grave close by. G.J. wanted surcease, were it but for an hour. He longed acutely, unbearably, to be for an hour with Christine in her warm, stuffy, exciting, languorous, enervating room hermetically sealed against the war. Then he remembered the tones of her voice as she had told her Belgian adventures…. Was it love? Was it tenderness? Was it sensuality? The difference was indiscernible; it had no importance. Against the stark background of infinite existence all human beings were alike and all their passions were alike. G.J. just caught them clear among much that was incomprehensible. An intense patriotism filled him. He could do nothing; but he could keep his head, keep his balance, practise magnanimity, uphold the truth amid prejudice and superstition, and be kind. Such at that moment seemed to be his mission…. He looked round, and pitied, instead of hating, the searchers after sensations. A being called the Garter King of Arms stepped forward and in a loud voice recited the earthly titles and honours of the simple little dead man; and, although few qualities are commoner than physical courage, the whole catalogue seemed ridiculous and tawdry until the being came to the two words, “Victoria Cross”. The being, having lived his glorious moments, withdrew. The Funeral March of Chopin tramped with its excruciating dragging tread across the ruins of the soul. And finally the cathedral was startled by the sudden trumpets of the Last Post, and the ceremony ended. Lord Roberts’s funeral yesterday was a very impressive event – I’m not sure that it wasn’t the most impressive I have ever seen. The cold showery, sleety day – the scratch lot of troops, representative in spite of their scratchness – the great dark Cathedral – the slow march and reversed weapons – khaki uniforms – no colour – and solemn Chopin March (which hits one somehow so much more than Handel) – it seemed to explain itself.– If you had known nothing about what has been happening, you would still have guessed what it was – the funeral of a great soldier at a time of grave national anxiety. 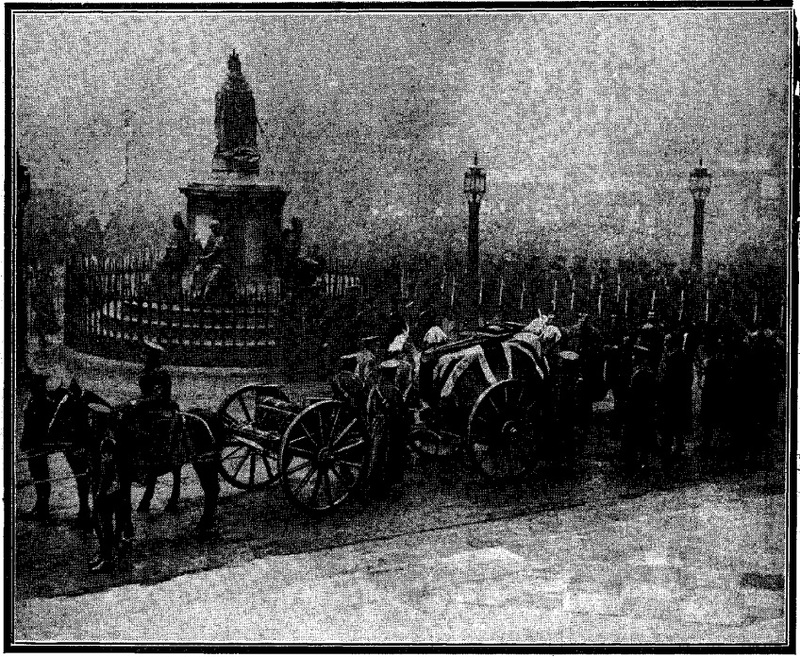 Roberts’s funeral was one of the big events of the first months of the Great War in London, between the rush to the colours and the Zeppelin raids. One gets the sense that Roberts’s death was in some way emblematic of the deaths of the much younger men dying every day at the Front, whose bodies were not brought back from burial in Britain (with the exception of the Unknown Warrior almost exactly six years later). On 23 November 1917, the bells of St Paul’s Cathedral rang out – for the first time in years – at the news of a great British victory. The advances of the previous week gave people a real sense that the British Armies were making progress on the Western Front. That feeling was short-lived. The joybells of the London churches to-day gave voice to the popular rejoicing at a great victory on the Western Front. It is the first time the peals have been rung since the outbreak of War. The victory was the success of the Third Army under General Sir Julian Byng in breaking through the Hindenburg Line to a length of ten miles and a depth of four or five near Cambrai. It is the best news we have had for a long time. I went up Ludgate Hill to hear St. Paul’s carillon starting the City chimes at noon. This carillon is rarely rung. It has not been heard since it celebrated the declaration of Peace after the South African War. There was a big crowd on the Cathedral steps and in the forecourt. After the clock had struck twelve, the big bell known as “Great Paul” – the bell that tolls for prayers – first boomed out, and was followed by the full peal of bells, twelve in number, which were a gift from the City Companies. The people cheered and cheered, exchanging greetings and smiles. The bells of the other churches, joining in with St. Paul’s, helped to swell the wings of sound carrying the joyful news to offices, shops and warehouses. Thanks to the black out and other precautions against air raids had silenced Britain’s church bells at night. In Westminster, Big Ben had been silent since 1914. The bells we not only rung in London, but across the country. 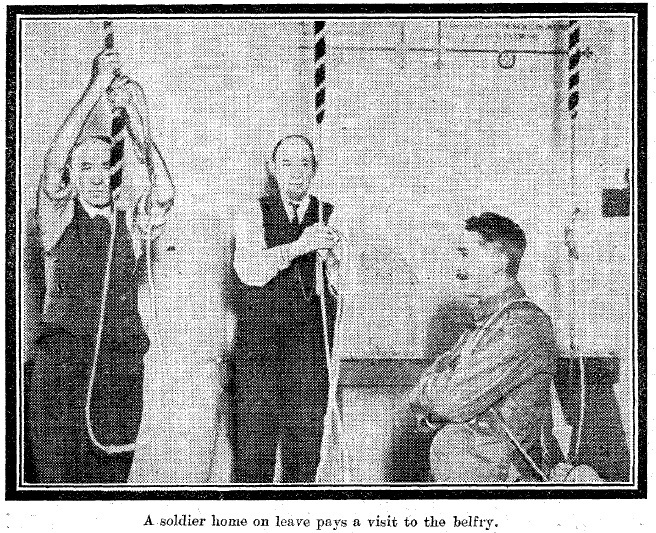 In Essex, the church bells at Stondon Massey were rung for half an hour, while in Broomfield (near Chelmsford) a local man set off a wad of gun-cotton in celebration, making locals fear an air raid was in progress. The attack was launched on the morning of 20 November, with 378 fighting tanks and their accompanying infantry advancing across trenches that the Germans had thought were impregnable. The attack on that day was enormously successful, breaching what the British called the ‘Hindenburg Line’ – to which the Germans had retreated to form stronger defences earlier in 1917 – for the first time. It was a limited success, though. Further advances were much harder and (as throughout 1916 and 1917) the hoped-for breakthrough failed to materialise. In the end the British army was left with a salient sticking out into German-held territory without an obvious defensive position. On 30 November, the Germans launched their counter-attack. By the time the fighting had ended, they had recaptured virtually all the land lost over the previous ten days, at great cost to the British and Imperial troops. In the end the two sides ended up virtually where they had started, each with a successful attack, a failure to make a breakthrough and losses of around 45,000 men to show for it. At Talbot House, in Poperinge, the annual debate on whether the war would end by the end of the coming year had registered a strong ‘yes’ vote in 1916 and 1917; held again in early 1918, the vote produced a tie – with only the chair’s casting vote producing an overall affirmative resolution that the war would end in 1918. Thanks to David Underdown for the correction about the silent bells. Today, the nation will mark the anniversary of the Armistice of 1918. Millions of people will keep a two minutes’ silence in memory of the men and women who died in the Great War, and other conflicts. Armistice Day in 1918 in London was quite different as people, understandably, swarmed through the streets celebrating the end of the war. Swirling crowds, fireworks, bonfires and stolen artillery pieces were the order of the day! The fighting on the Western Front ended at 11 a.m. on 11 November 1918. News of the Armistice immediately spread through London. Guns were fired to announce the occasion in central London; in Croydon, the air-raid warning maroons were fired, followed by the all-clear bugle calls; the Union Flag was run up the flagpoles of the town hall and churches simultaneously. In the City of London, ‘Within a minute the central streets were packed from side to side with wildly cheering crowds’ and the buildings sprouted flags and decorations. Outside Buckingham Palace, 5,000 people gathered within five minutes. At 11.15, the King appeared on the balcony before a large and vociferous gathering. That evening, Vera Brittain was outside the Admiralty building on Whitehall where “a crazy group of convalescent Tommies were collecting specimens of different uniforms and bundling their wearers into flag-strewn taxis; with a shout they seized two of my companions and disappeared into the clamorous crowd, waving flags and shaking rattles”. It was not quite a day universal joy. For some, the thought of what, or whom, they had lost prevented it being a day for celebration. Georgina Lee’s friend Florence Younghusband ‘was on top of a bus when the guns were fired. In front of her were two soldiers one with his face horribly scarred. He looked straight ahead and remained stonily silent; the other just bowed his head in his hand and burst out crying. The omnibus conductress dropped into the vacant seat next to Florence, leant her head to her soldier and cried too. “I lost my man two months ago, I can’t be happy today”, she murmured.’ Likewise, Vera Brittain simply wanted to be alone, realising that the young men she cared about and had wanted to share her future with were gone. The mood of the day, though, was predominantly one of celebration. All across London, crowds gathered in public places. Mayors made speeches from the steps or balconies of their town halls. 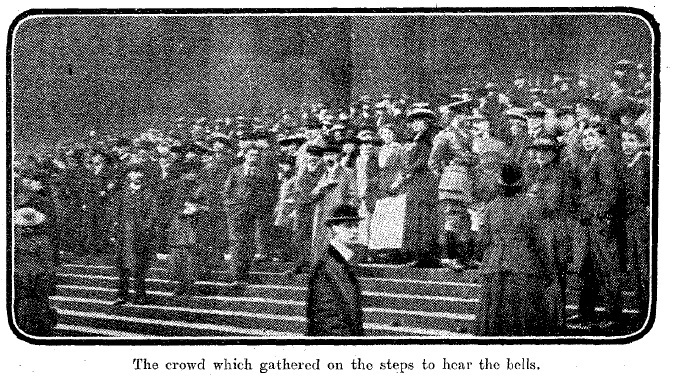 The festivities were not as extensive beyond Westminster and the West End, but many Londoners had streamed across the capital to be part of that crowd (around 100,000 are estimated to have taken to the streets to celebrate the Armistice). The King and Queen’s visit to the East End on 12 November was described as a ‘return visit’ after so many had come to Westminster the previous day. Despite this description of calmness, the Daily Express described a ‘pandemonium’ on 12 and 13 November, with ‘rivers of people’ and ‘whirlpools of dancers’, accompanied by concertinas, cornets, tambourines, wooden rattles and singing. On the 12th, a big bonfire was lit on Trafalgar Square against the base of Nelson’s Column; it was started at around 10 p.m. and fuelled by wooden road-blocks from the nearby roads, and a temporary wooden structure in the square was burned to the ground – later one of the captured German guns that lined the Mall was added to the flames! That night, the whole square was full of people setting off fireworks and crackers. Another bonfire was lit in Piccadilly Circus, fuelled by advertising hoardings from the Pavilion theatre. The flames of the Trafalgar Square bonfire actually caused permanent damage to the plinth of Nelson’s Column. After the war, the authorities decided that replacing the stone with new pieces would look worse than leaving the original damaged pieces in place. The damage is still visible on the western side of the plinth. On the 13th, a number of German guns went missing. “One gun was taken for a riotous joy-ride on a great motor-lorry” and disappeared along the Strand towards the East End trailing a “Buy War Bonds” banner, according to the Express. Others were pulled by hand and abandoned nearby; many appeared in Trafalgar Square, one making it as far as Piccadilly Circus. Just before midnight, the gates of Admiralty Arch were closed to try to stop the departure of more of the weapons. Another bonfire was lit in Trafalgar Square, this time near the end of Cockspur Street. Some soldiers fetched another captured German gun, which was again added to the fire while the crowd cheered. In the years after 1918, Armistice Day became increasingly a day for reflection and mourning rather than celebration – particularly once it became obvious that war in Europe had not been banished for ever. 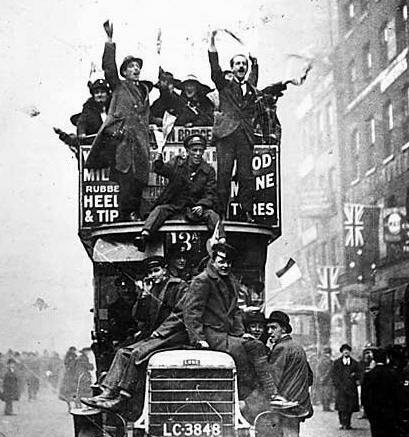 On 11 November 1918, though, the mood in London was primarily – and understandably – one of relief and rejoicing for the lifting of the immediate burden of the war.